With figs very much in season, and there for the picking in the vineyards (for free ! 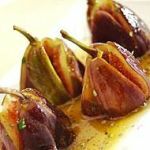 ), Tamasin Day Lewis's luscious roasted figs make a simple but impressive dessert for a special occasion. Put the honey, butter, liqueur and cinnamon in a small saucepan. Heat gently, stirring, until liquid. Using a small, sharp knife, make a cut like a cross in the top of each fig, cutting almost down to the base. Place them upright in a roasting pan, splaying them out shamelessly as you go. Pour the liquid over each one. Roast for 15 minutes. Sprinkle a bit of thyme over each fig. Return to the oven, switch it off, leaving the door ajar. Leave the figs in the oven for 5-10 minutes before serving.